Persistence Market Research’s report, titled “Baby personal care Market – Global Industry Analysis 2012-2016, and Forecast, 2017-2022,” offers a comprehensive assessment of the global baby personal care market, weighing several growth prospects for a five-year forecast period. Historical data on the expansion of global baby personal care market till date has been utilized as the primary point reference, upon which market size forecasts have been deduced. Several distinctive sections are compiled in the report to offer an in-depth analysis of the baby personal care market and understand the potential of assumptive scenarios towards global market expansion for the next five years. The report commences with an executive summary, which includes an abstract of key research findings. Highlights mentions in the executive summary particularly aim at revealing the expansion of baby personal care markets across multiple regions. To offer an overview of the global baby personal care market, the report provides a market introduction (developed from an analytical perspective) and a standard definition to the term – baby personal care. The report further offers a wide forecast purview by revealing market size estimations & analysis for baby personal care markets at global parameters. The report includes a section addressing the macroeconomics of baby personal care markets, wherein trends influencing the growth of baby personal care sales and production have been analyzed. This section also offers cost structure & pricing analysis, evaluation of prominent raw material sourcing strategies, supply chain breakdown, and an intensity map tracking the presence of key players in the overall market. The subsequent chapters offer segmented analysis on the global baby personal care market, which can be employed for recognizing all fragments involving the global sales of baby personal care products. The report concludes with a systematic profiling of leading market players, revealing their latest developments and current market standings. 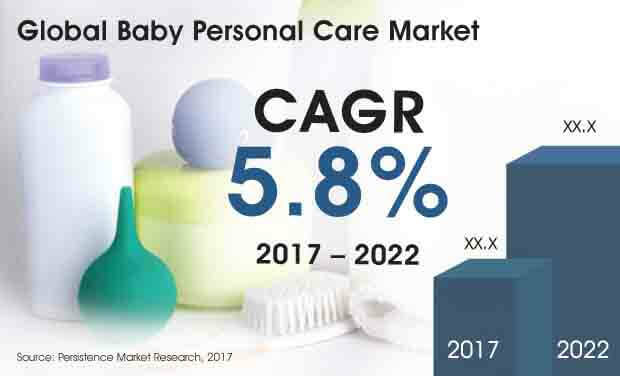 An elaborate competitive landscape on global baby personal care market, exhibited in this section, is directed to offer insights on industry leaders as well as market entrants. Key information on the analysis of global baby personal care market is based in the chapters comprising of segmental forecasts. The report has segmented the global market for baby personal care into – product-types, sales channels, price, and region. Sub-categories within these segments are showcased in the market taxonomy table below. Analysis and forecast offered in these sections has been gauged across wide-ranging metrics such as Y-o-Y growth rates, CAGRs, absolute dollar opportunities, and revenue share ratios. Cross-sectional data and country-wise analysis is also provided in the following chapters. Persistence Market Research employs robust research methodology in development of its market studies. Our analysts conduct extensive research across primary and secondary sources, aggregating net revenues procured from authoritative databases and direct contacts. The scope of the report is to offer future prospects on global baby personal care market, which enables market participants in planning towards long-term business growth. When parents take an overwhelming number of decisions towards the care of their babies, selecting the right personal care products becomes pivotal. Considering this, a majority of baby personal care products are mandated to seek premarket approvals from notable administration bodies such as the US FDA. In addition, baby personal care product manufacturers continue to recalibrate their production techniques in a bid to ensure absence of ingredients that may potentially harm the health of babies. Packaging practices adopted by these companies are aimed at facilitating full product transparency through labels that elaborately reveal the contents of baby personal care products. In the near future, the global baby personal care market is likely to witness emergence of organic alternatives, which can lead to a decline in use of synthetic ingredients. Considering their variety, baby personal care products are available across various product lines such as skin care, hair care, and toiletries. Production of baby personal care products involves an attentive selection of ingredients, wherein inclusion of benign constituent materials is prioritized. Persistence Market Research projects that the global market for baby personal care products will expand at a robust pace during the forecast period, 2017-2022. The report has identified multiple factors influencing the dynamics of global baby personal care market, which has been inferred in the market size analysis offered. According to the report, global sales of baby personal care products are anticipated to rake over US$ 83 Bn in revenues towards the end of 2022. Among the wide range of products offered under the umbrella of baby personal care, skin care products are expected to hold the leading position. In 2017, sales of skin care products across the globe are predicted to bring in over US$ 17.7 Bn in revenues. The demand for hair care products is also expected to gain traction, owing to increasing adoption of baby hair grooming as a daily routine among parents. The report also projects that oral care products and fragrances will be the least-selling baby personal care products in the global market. Furthermore, the report has analyzed key sales channels in the global baby personal care market. Through 2022, baby personal care product sales are expected to remain concentered to modern trade outlets across the globe. In 2017, sales of baby personal care products through modern trade outlets are likely to procure more than one-third of global revenues. Towards the end of 2022, online sales of baby personal care products are also expected to gain traction. Between 2017 and 2022, online retailers will create an incremental opportunity of nearly US$ 3.5 Bn in the global market for baby personal care products. The report also observes higher traction for sales of mass baby care products as parents continue to opt for baby personal care products at affordable prices. Manufacturers of baby personal care products are also expected to shift their focus towards boosting the capacity for mass baby care products. Companies such as Kimberly-Clark Corporation, KAS Direct, LLC, Johnson & Johnson, Unilever Plc, Procter & Gamble Co., Wipro Consumer Care and Lighting Ltd., Avon Products, Inc., Burt's Bees, Inc., Beiersdorf AG, Artsana S.p.A., and Loreal SA are observed to remain key players in the global baby personal care market throughout the forecast period.